Lay out the crescent rolls and press seams together. Mix cream cheese with brown sugar and vanilla until soft. 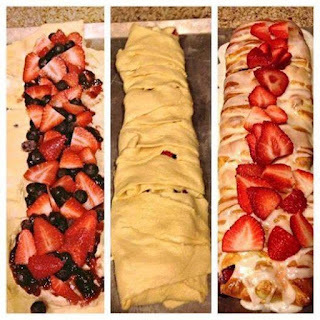 Spread inside crescent rolls. Then spread preserves on top. Sprinkle blueberries and strawberries on top. Pull edges of crescent rolls over. Egg wash pastry. Bake at 375 for 20 mins. In separate bowl mix juice and zest of a lemon with confectioners sugar until it becomes an icing. Garnish with strawberries.